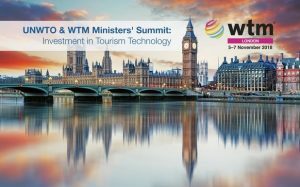 London (United Kingdom) – November 2, 2018 (travelindex.com) – The 2018 edition of World Travel Market (WTM) will see the World Tourism Organization (UNWTO) continue its operational focus on investing in innovation and digital advances for a tourism sector that can deliver opportunities for all. UNWTO will co-host a Ministerial Summit and launch a white paper on the relationship between music and tourism at the UK tourism trade fair on 6-7 November 2018. Following the official celebration of World Tourism Day 2018 (27 September) in Budapest, Hungary under the theme of ‘Tourism and the Digital Transformation’, and the ‘Tourism Tech Adventure: Big Data Solutions’ forum held in Manama, Bahrain on 1 November, UNWTO will host this year’s UNWTO/WTM Minister’s Summit on 6 November on the topic ‘Investment in Tourism Technology’. The Summit will continue the conversation on innovation and digital transformation, a UNWTO priority designed to give tourism its deserved prominence on the digital agenda. It will debut a disruptive new format, involving private sector leaders for the first time. A panel of investors will discuss investment in tourism technology, followed by the ministerial segment that this year will link both public and private sectors to set the agenda for ensuring the sector’s digital transformation enhances its inclusion, sustainability and competitiveness. Both panels will be moderated by CNN’s foremost international business correspondent Richard Quest, anchor of Quest Means Business, with focus on creating innovative ideas and partnerships that can boost investment. Developing an innovation ecosystem, data-driven decision making, digital destination branding, and the role of government and policy in smart tourism management are among the topics to be addressed. UNWTO’s presence at WTM will also encompass the launch of a new white paper, produced in partnership with Procolombia and Sound Diplomacy, examining the role of music in tourism development, marketing and experiences, and the economic benefits of music and tourism sector partnerships. The launch of ‘Music is the New Gastronomy’ on 6 November will accompany a panel exploring the value of music tourism in depth.